We wrote a number of articles in the past about how you can find your lost Android phone, lost iPhone and even laptop. The focus was on finding those devices without any installed tracking apps – because this is almost always the case. Only once you lose your expensive piece of hardware, you realize that you should’ve installed some kind of app that allows you to locate it quickly. Although there are preinstalled services like Android Device Manager and Find my iPhone, they only offer a few options that let you track your device and erase its data. Obviously, those are the most important features any tracking app should have, but having more options and control could make the search for it much easier. That’s where other tracking apps come into play, especially one in particular – Cerberus. I have been using Cerberus for years already and I’m a big fan of it. Once you set it up, you can forget about it until you actually need it. 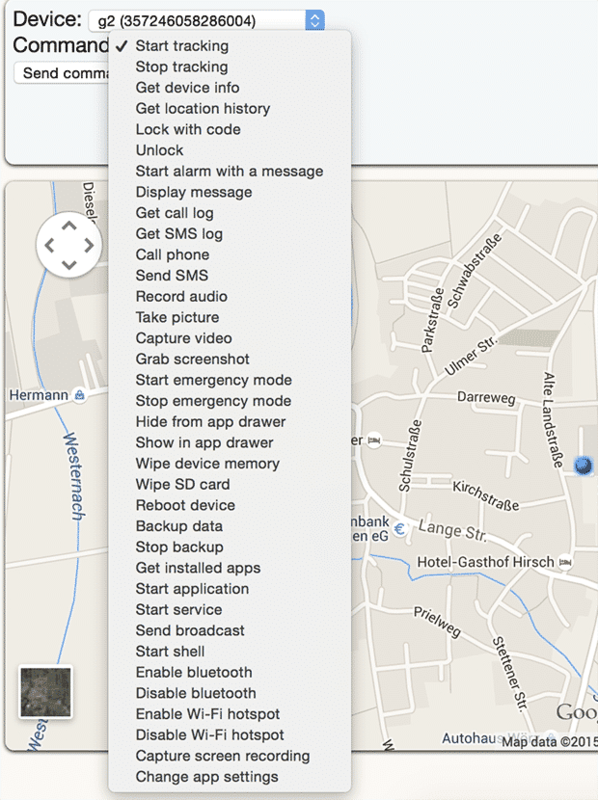 You can locate and control your phone by loggin into Cerberus’ website. Find My Device is a great tool in less serious cases. For example, you misplaced your phone at home and cannot find it. 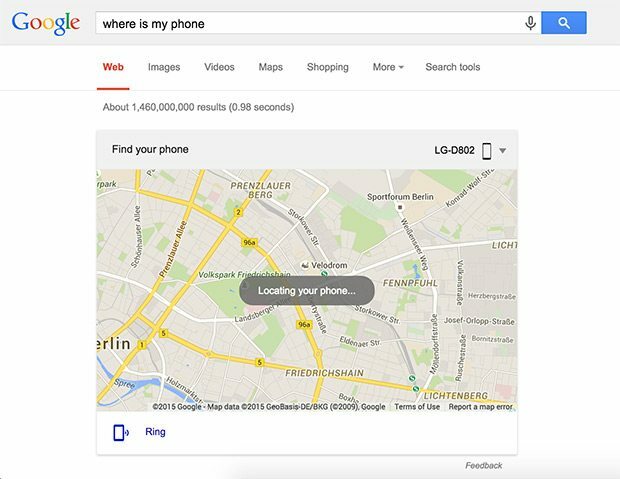 Going to Google and entering “Where is my phone” will bring up its location and the option to let it ring. In more serious cases, you can also use ADM to wipe your device (which will make it impossible to track afterwards). Cerberus should be your go-to tool if you lose your phone somewhere outside or if someone stole it. It offers a wide range of features to track and control your lost phone. On top of that, it displays you’re phone’s current IP address and how much battery it has left. This helps you figuring out how long you can track it until the battery dies and you can report the IP address to the authorities in case it got stolen. In the screenshot below, you can see all the different options available in Cerberus. In case of theft, Cerberus won’t show a thief directly that you’re tracking the phone. Usually, only the GPS icon will appear in the top notification bar. This might raise eyebrows but won’t directly show that a tracking app is active. Find My Device triggers a much more obvious notification. Once this happens, even the dumbest thief gets what’s going on. Once you have Cerberus installed on your phone, you should go through all the available settings and adjust them to your liking. I recommend to hide the app in your app drawer so no stranger discovers it while going through your apps. You can set a custom number that you can call in order to open the app. 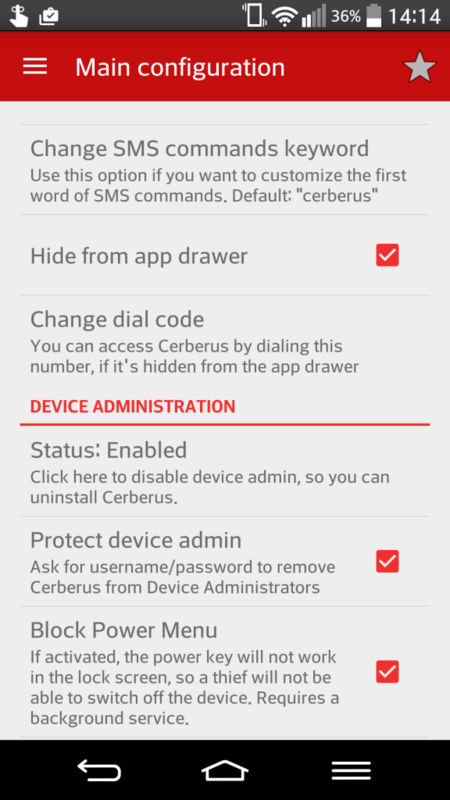 Also important is to make Cerberus a device admin. This gives the app the permission to lock and wipe your device. Without enabling that, you won’t be able to remotely delete your private data. Another nice option is to block the power menu. With that enabled, it’s not possible to turn off your phone while on lock screen. This can buy you a lot of time to track it down if someone stole your phone. In case you rooted your phone and you know how to flash files, then you should download a flashable ZIP file and do that instead of installing it the normal way. You can even flash a “disguised” version of Cerberus that will only show up with the name “System Framework”. The big advantage of having a flashed version on your phone is that it’s very hard to get rid of the app. Even if someone performs a factory reset, Cerberus stays on your phone and keeps working. Only installing a different ROM will bet rid of it. Cerberus offers a one week free trial before it prompts you to pay for a lifetime licence. Right now, that would cost you 4,99€. This might sound like a lot if you normally don’t pay for apps. However, you should think about the potential cost of losing your phone. If you set it up correctly, it’s money well spent (even more if you flash it).